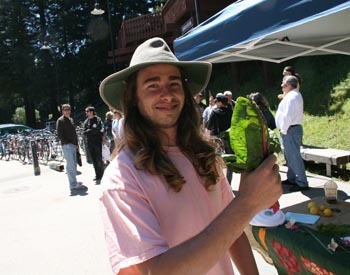 Earth Week 2011 is UCSC's most ambitious Earth Day-related celebration ever. The week is dedicated to dialogue and action supporting sustainable culture. Ryan Abelson, 21, a UCSC agroecology major, proudly shows off some sustainably grown organic produce during the kick-off of Earth Week on campus Friday. 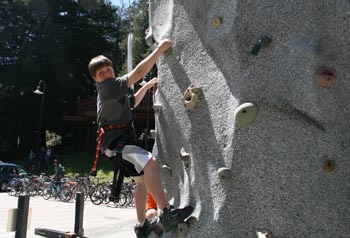 Nathan Kertz, 12, son of UCSC alumna Rachel Kertz, Class of 1990, enjoyed the free climbing wall activity during the Earth Week kick-off on Friday. Instead, they've organized an entire Earth Week, which kicks off on Friday, April 15, and continues through Earth Day itself--Friday, April 22. This year's theme is "Celebrating Sustainable Community, Culture and the Place We Live." Earth Week is part carnival, part art fair, and part brainstorming session. Activities are free and open to the public. The week will feature everything from a serious discussion about the Japanese nuclear disaster to a sunset walk, a stargazing workshop, a hike to hidden spots on campus, an outdoor movie screening, and an art workshop featuring recyclable materials. There will be a strong emphasis on DIY and hands-on activities as well as hikes and lectures. Climb a wall: Friday, April 15 from noon to 4 p.m. The Earth Week kick-off event, held at the UCSC Quarry Plaza, features farm-fresh produce at the Program in Community and Agroecology's market cart, free climbing on a climbing wall, and a special "hydration station" showing the benefits of reusable water bottles. The display also encourages people not to use single-use disposable water bottles. Clean a lagoon: Saturday, April 16. A clean-up at Younger Lagoon will take place between 10 a.m. and 2 p.m., involving the Campus Stewardship Program and the Campus Natural Reserve. Volunteers will plant various native species after meeting at the Seymour Discovery Center whale skeleton. Celebrate with Santa Cruz: Saturday, April 16. A community Earth Day celebration will be held from 11 a.m. to 4 p.m. at San Lorenzo Park in Santa Cruz, with help from the City of Santa Cruz, Santa Cruz County, Ecology Action, Save Our Shores, and other groups of local nonprofits and concerned citizens. The event will feature a river clean-up. Hike to a secret spot: Saturday, April 16: Hikers will light out from the Stevenson Knoll above East Field at 1 p.m. and explore some of the campus's legendary hidden and natural locations. The hiking and exploring last until 5 p.m. Bring water and snacks. The guides promise places "you can really sink your toes into." Head to the fair: Saturday, April 16. College Eight and Oakes College have teamed up to present an Earth Fest–Sustainability Fair from 1 p.m. to 3 p.m. at College Eight Plaza, featuring sustainable foods and activities. Learning from tragedy: Tuesday, April 19. UCSC nuclear policy lecturer Daniel Hirsch will present a lecture on the recent nuclear tragedy in Japan from 7 p.m. to 9 p.m. at the Stevenson College Event Center. Talk about the future: Thursday, April 21. The artist/author/social and environmental justice advocate Osprey Oriel Lake will lead a discussion called "Where Are We Going: Environmental and Cultural Sustenance for our Times," at 7 p.m at the Oakes Learning Center. Join a summit on sustainability: The 10th annual Campus Earth Summit begins at 9:30 a.m. Friday at the College Nine and Ten multipurpose room. The Earth Summit's keynote speakers are Fred Keeley, past state assemblymember and current treasurer of Santa Cruz County, and Matthew St. Clair, sustainability manager for the UC Office of the President. As shown by this comprehensive activities list, this is the most intensive set of UCSC Earth Day celebrations ever. While the emphasis is on celebration and fun, there is a pragmatic aspect to the events; many activities are meant to be jumping-off points for students who want to undertake their own green-friendly projects, get funding for their programs, and engage with other user groups. The UCSC community has united behind each of these events, with staff and faculty helping out at each event. But Earth Week is the result of a strong student vision that has been taking shape on campus in recent years. "There is a collective capacity to make good things happen here," said Michael Kittredge, the College Eight programs coordinator. 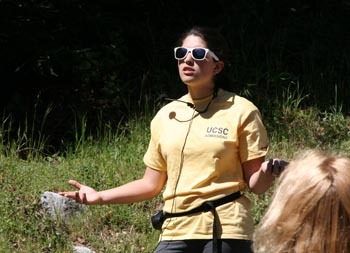 "And there are so many folks, from so many aspects of life at UCSC, that have a hand in this: the dining staff, programs offices, faculty and staff--they are all connecting back to our community." Kittredge and Chancellor's Undergraduate Internship Program intern Tyler Jessen organized a number of Earth Week activities that center around College Eight this year and reached out to other stakeholders on campus. The two of them coordinated this year's Earth Week website, the outreach campaign, the logo, and the keynote speaker event. "This is a perfect example of what I like to call grassroots organizing," Kittredge said. "We started meeting with other campus groups and organizations in January, from OPERS to the Farm to the resource centers. We started throwing out an idea that grew out of a student project a number of years ago; wouldn't it be great if we had a UCSC Earth Week?" But why would UCSC need such a high-profile "green" event, on a campus that is starting to draw national recognition for "green" building and a food service program that has helped UCSC win recognition from the Sierra Club and other organizations? Kittredge explained that there is plenty of room for UCSC to grow its green practices and increase community awareness. "While there is definitely a culture that exists at UCSC around sustainability work, we are still the size of a small town, with15,000 students and 2,500 employees. While there is a sustainable culture here, not all students know about these opportunities." Earth Week, he said, is a great way for the broader population to get its feet wet and become more involved. Another major shareholder in this year's Earth Week activities is the Student Environmental Center, which organized the Campus Earth Summit, one of the week's cornerstone events. "I am so inspired to see how Earth Week has grown from a few students to a campus-wide collaborative effort," said Gabi Kirk, a Kresge College junior who is majoring in environmental studies and history. Kirk is co-chair of the Student Environmental Center, the influential student organization that is hosting and organizing the summit. The all-day, student-run summit will bring together students, staff, faculty, and community members to prioritize green-minded and sustainable projects on campus. The summit, which takes place at the Colleges Nine and Ten multipurpose room, begins at 9:30 a.m. and wraps up at 2 p.m. on Earth Day. This event is a brainstorming session and an intensive dialogue aimed at helping the campus on its path toward sustainability. Attendees will hear updates on UCSC's Campus Sustainabilty Plan, and will contribute ideas to a non-binding, informational "blueprint" for a sustainable campus. "These discussions are geared to get as many ideas on the table as possible," said Tyler Pitts, a staff member who is working with the Student Organization Advising & Resources [SOAR] on the Earth Summit event. Pitts also works with the Student Environmental Center and the Education for Sustainable Living Program as an advisor. Pitts said the campus has made strides in recent years, "but a lot of people have great ideas and don't realize there are places to go to get funding for their projects on campus." Earth Week will also include a special visit and discussion with a group of visiting Hawaiian academics and food growers, who want to learn from UCSC's green practices and hope to incorporate some of them back home. UCSC's Division of Social Sciences, the Center for Agroecology and Sustainable Food System, and the Sustainability Office will host several faculty members and the vice chancellor of academic affairs from the University of Hawaii West O'ahu campus, along representatives from Ma'o Farms during their two-day UCSC visit. During the visit, UCSC staff and faculty will share insight about making campus operations more efficient, incorporating green practices into a curriculum, and developing a campus-wide sustainability plan. Presentations featuring the University of Hawaii and Ma'o Farms will be held at Thursday, April 21st, from 10am-12pm at UCSC's Namaste Lounge, which is located along the College Nine service road, off of McLaughlin Drive.